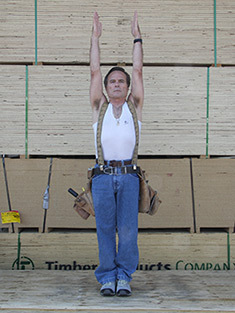 Yoga with Your Boots On, was founded by Allan Nett, a Certified Iyengar Yoga instructor for 25 years, and a construction contractor for 29 years. Nett is available to visit individual job sites to provide consultations regarding the designing of yoga classes for the entire crew. turn prevents future injuries, and reduces medical injury costs. 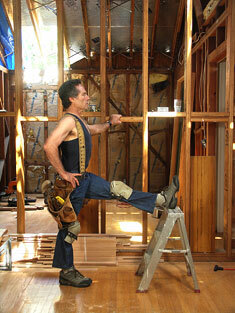 the job can be prevented with aware body movement. injury due to heavy lifting and repetitive movements. In YCI workshops, students learn simple, applicable yoga stretches to counter the “wear and tear” that construction work often causes. In Allan's yoga workshops, students gain an understanding of how to use postures to get relief from their aches and pains, on and off the job. of the body and awareness of the mind create balance in human beings. 10 years younger, and has even lost 40lbs. as an added benefit. knot on the lower right side of his back from lifting doors for over 35 years. life," Larry said regarding his injury. 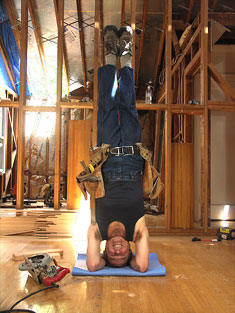 As you can see, the headstand came first; the tool belt came later!